Julep Giveaway - Free iPad and 80+ Julep Polishes!!! I came across This Julep Giveaway today, and I Had to share! 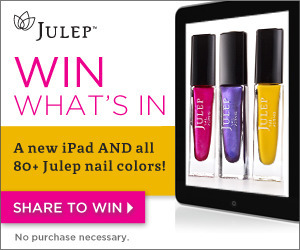 Click Here to Enter now, for a chance to win a New iPad and all 80+ Julep Nail Polishes!!! Sounds too good to be true right? Lol.. It's real because it's on Juleps blog! Well, Yeah yeah, I hope you win too, but come on!!! I wanna Win! Hahaha!!! EDIT: After you've entered, Check your email, and click on the link in the email. That's the link that actually enters you! Phew! I just saw that...!!! When you click the link and "subscribe", it'll say you've now been entered into the giveaway.